What are healthy carbohydrates for a diabetic? What are you supposed to be eating? Especially to keep your blood sugar levels in a healthy range? These are common questions that can be confusing so let's get straight to business and dig in and answer those questions now. Let's walk through some of the individual aspects and then we'll wrap it up into something simple and practical at the end, okay? The body has essential needs for amino acids (protein) and fats but there are no essential carbohydrates required! Thankfully though, there are healthy carbs you can eat. And there are also a range of low carb foods you can buy, which means you can still enjoy delicious tasty meals. The average person consumes way too many carbohydrate foods – around 800 calories worth per day, according to one study comparing 158 countries! The thing to understand, is that as a diabetic, carbohydrates are the type of food you need to get a good handle on. Why? Because the amount of carbs you eat influences your blood sugar and A1C more than any other nutrient. Dinner: Spaghetti pasta with a jar of sugar-filled bolognese sauce – carbs. As you can see, carbohydrates total to around 337 g for just one day eating such a menu. Even just one day like this is problematic, let alone eating that many carbs day in and day out. It also provides very little in the way of nutritional quality. Studies indicate that while the average person tends to eat a lot these days we have rising levels of nutritional deficiencies, even in Western societies where food is ample! As a person with diabetes, you may have been told to eat more carbohydrates and less protein and fat – that's been a very common recommendation for decades. Unfortunately, this is very problematic because as a diabetic you are essentially carbohydrate intolerant. Meaning, your body has lost the capacity to deal with glucose in the blood effectively. While every person does have a different rate of carb intolerance, a lower carb diet has proven the best method for lowering blood sugar and A1C levels. Let's just get back to basics for a second and focus on how carbs influence your body. You eat carbohydrates -> Your body processes this and as a natural response your blood glucose rises -> Your pancreas releases the hormone insulin to lower your blood glucose -> As a diabetic you have an inability to uptake glucose into the cell effectively, which leaves your blood glucose high (this is called insulin resistance) -> More insulin in the bloodstream increases insulin resistance -> Insulin is also the fat storage hormone so all the excess glucose in your blood gets pushed into fat cells -> This increases triglycerides and cholesterol levels and increases inflammation causing more issues. -> So it can become a bit of a repetitive cycle. Here's a simple video that shows how the carbohydrates we eat triggers insulin. The affect of carbohydrate intake on blood glucose occurs whether we have diabetes or not. Carbohydrates are carbohydrates. This is the natural physiological response of the body. But, as a diabetic, your ability to deal with the carbs is impaired. So how can you lower and control this high blood glucose? You have to change gears on the type of carbohydrates you eat. When you think of carbohydrates, it probably brings to mind things like potatoes, rice, pasta and bread. And more than likely, many things on this common list of carb sources include processed and refined foods such as white bread, white pasta, and white rice, which are high energy carbohydrate foods that will spike your blood sugar much quicker than a complex carb. Simple sugars/carbs – refined white sugars, white flours, white breads, white pastas – these uptake into the bloodstream with little digestive processing needed, and therefore, they tend to spike blood sugar faster and higher. Complex sugars/carbs – have to get processed and converted to glucose and take longer to enter the bloodstream. Complex carbohydrates are often higher in dietary fiber, and the fiber is there to slow digestion and absorption of glucose so that blood sugar raises slower and hormone levels stay more stable. It's good to be aware of what simple and complex carbs are because if you go read other websites you will notice that the carbohydrate advice for people with diabetes, often says to include complex carbs. Even if it takes longer to digest, the glucose is still going to end up in your bloodstream! So for a diabetic that means even complex carbs from things like grains can be problematic because they are high in carbohydrate content. So let's dig even deeper to find out why and what your best choices are. Vegetables are a complex carbohydrate! Most people don't think of vegetables when they think of carbs. However, vegetables are the type of carbs you really need to focus on eating more of, because they are more nutrient dense – meaning, they are full of vital vitamins, minerals, antioxidants, and other compounds that the body needs to fuel it’s optimal function. Statistics show that only 8% of the population are eating the recommended 5 servings a day of vegetables, with 25% getting only one serve a day, and the rest…well they are not eating any veggies at all! One serving of vegetables is equivalent to around half a cup. So 2.5 cups a day minimum is the main aim. With diabetes though, since you need to cut down on other high carb foods – potatoes, rice, bread, pasta – you should really be eating way more than 2.5 cups of veggies per day. Vegetables contain so many valuable nutrients and compounds that can guard us against disease. They reduce energy density of the diet, helping you lose weight. They provide valuable fiber that helps promote healthy digestion, they help reduce sugar cravings, and they just make you feel great. Vegetables are by far the very best form of carbohydrate for you to choose, well at least most of them are. Fruit is a natural food source so if you were to choose something sweet you'd be far better to choose a small piece of fruit. However, most fruit also happens to be a high source of carbohydrates. And despite commonly held assumptions that fruit juice is healthy, it's not. Fruit juice is a BIG NO NO! It's extremely high in sugar/ carbs. Take a look at this apple verse apple juice comparison. As you can see, eating the whole apple provides 19 g total carbs, 3 g fiber, 14 g sugar. Whereas, if you drink 1 cup apple juice, it sharply increases the carb and sugar count, and decreases fiber. It helps to have a visual comparison right? All and all, when it comes to fruit, the best fruits for a diabetic are berries such as strawberries, raspberries, blueberries. These are your lower carb options and you can have around 1/2 cup per serve. 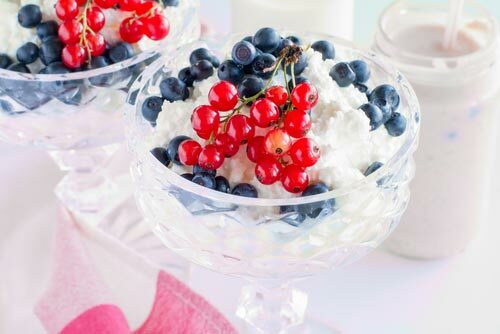 Berries make a nice dessert served with something like cottage cheese or yogurt. Now we've already covered all the white processed forms of grains above. Things like white rice, white pasta, white bread, white flour, and packaged foods that often contain simple carbs, and sorry to say but these all have to get the cut. Well, they are a complex carbohydrate and you can eat whole grains and count carbs and monitor your intake. BUT it is far, far easier to get better results if you AVOID ALL GRAINS! Did you just say avoid all grains? The American Diabetes Association 2017 Standards of Medical Care in Diabetes, state that: “whole-grain consumption is not associated with improvements in glycemic control in type 2 diabetes.” Or in other words, it does not help you regulate blood sugar and A1c – that's what the research clearly shows. There is no evidence to suggest whole grains benefit blood sugar in any way, quite simply because they are a high carb food. And hopefully by now you are beginning to understand their strong influence on your numbers. Eliminating grains does come as a shock to many people but if you REALLY want to control your blood sugar and avoid the progression of complications long term, then avoiding grains is the way to go. It also helps to un-complicate things for you, allowing you to enjoy your food more without having to worry so much about counting every single carb. Sure, it's an adjustment. But you certainly won't starve. There are plenty of things you can still eat – if you're stuck for ideas, check out our weekly meal plans. 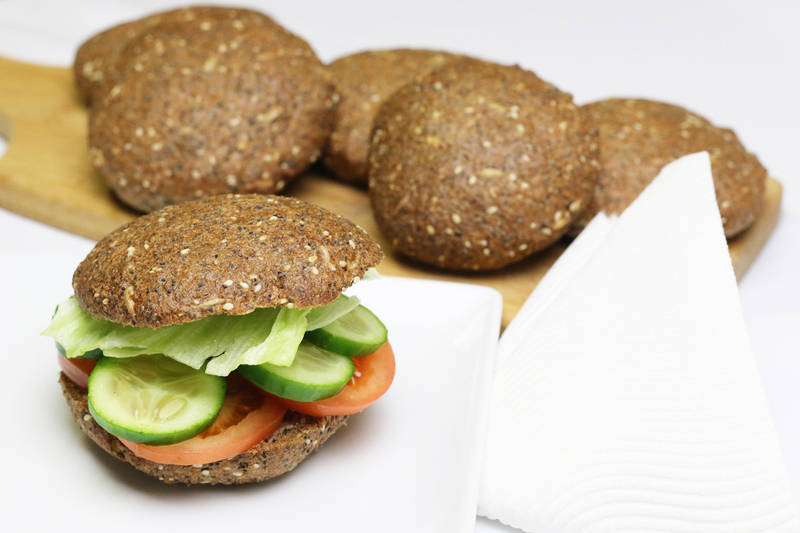 Pictured above are two of our low carb breads – even without grains there is plenty to eat! Anyway, let's just get back to the whole grain debate for just one minute. Let's just say you want to have a couple of slices of toast for breakfast or some brown rice with dinner and you're aiming to keep your carb count to 30 g per meal. Brown rice has a net carb count of 19 g per serve (1/2 cup). Now half a cup isn't that much, and most people normally eat more than this (it's easy to do). So you would have to measure your portion sizes AND keep a closer check on your blood sugar levels. NOTE: Total carbs minus fiber = net carbs. 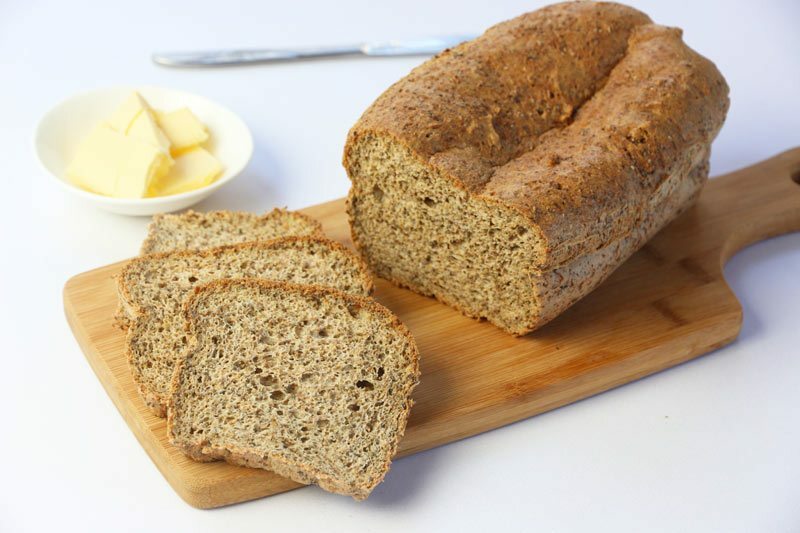 1 slice whole grain toast has a net carb count of 12.5-15 g per serve. So if you wanted to eat 2 slices that bumps you up to 25-30 g just for just the toast, without any toppings. What most people don't realize is that grain based foods are very high in carbohydrates. So avoiding them, at least for the most part, cuts out a majorly big hassle for you. And helps you control blood sugar and A1C levels much easier. Beans and legumes include things like adzuki beans, chickpeas, brown and red lentils, lima beans, borlotti beans, broad beans, fava beans, garbanzo, lima beans, navy beans, mung beans, and so forth. These do contain protein, but they are predominantly a carbohydrate food. While beans and legumes are beneficial for feeding gut bacteria that support our health, you need to keep a tight limit on your portions. If you were to follow a truly low carb diet, you would exclude beans and legumes. 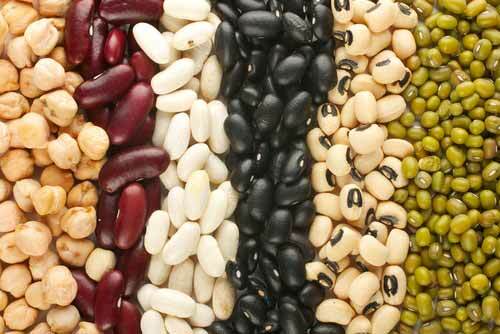 BUT, there is research to show that the soluble fiber in beans and legumes provide some great health benefits. They have a low glycemic index and are considered slow carbs, so for most people, it's okay to eat the lower carb bean and legume options in moderation (1/4 cup per serve). The soluble fiber also dramatically slows down the glucose uptake. Yes it still does end up in the bloodstream, but if you want to include beans and legumes, then limit them to 1/4 cup serving only and choose the lower carb options as outlined above. That's only going to be around 6-8 g net carbs per serve, and you can still include lots of veggies and some meat for a well-rounded meal. Note though, some people with diabetes will not be able to tolerate any beans or legumes. The only real way to know is to use your blood sugar monitor and assess how foods influence you. Where Does That Leave Us So Far? What about bread? Can I still eat bread? Breakfast cereals are off the list, at least the kind you find on the supermarket shelf. Yes, even things like wheat biscuits and whole grain options, and even oatmeal in many cases, we've already talked about why. When it comes to bread, there's no doubt that it’s something that everyone loves, but we can definitely live without it. Of course, there are low carb bread options, too. Still, you can live without bread for the most part. It just takes a little getting used to. And of course, if you're motivated to make your own breads, there are loads of low carb flours you can use instead. We’ve been conditioned to think we need to eat cereal for breakfast because we have this idea in our head about what breakfast foods are, we've just been raised like that. But what you need to be eating for breakfast is a real wholesome meal loaded with good food. 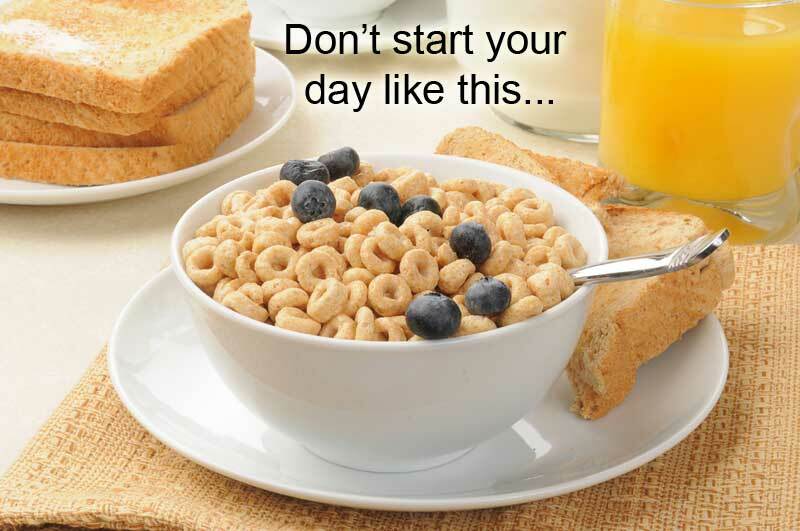 The beginning of the day is the most critical time to eat a good meal in order to sustain your energy, balance your hormones, and prevent sugar cravings and binge attacks later in the day. The trick is to start thinking about breakfast differently. 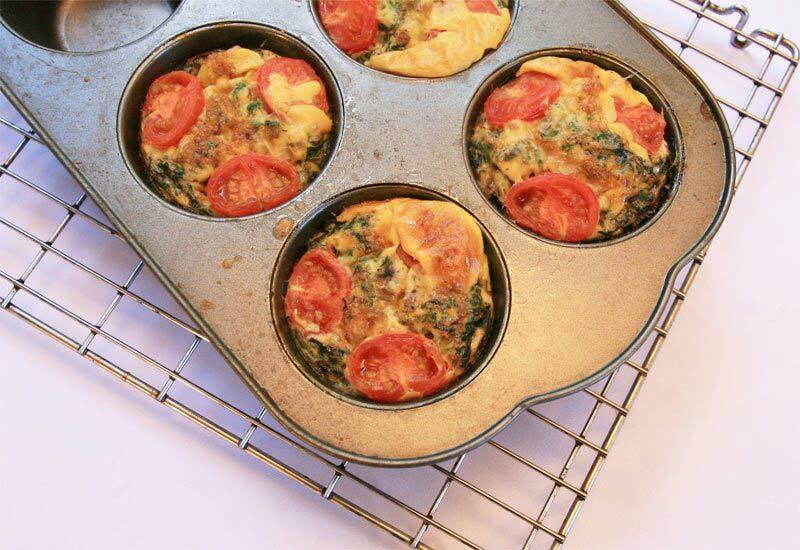 Why not have egg muffins, make a low carb muesli, eat a chicken and vegetable soup for breakfast (yes, soup works well for breakfast! ), or have some eggs and veggies – like a mixed veggie omelet. Yes, it may sound strange and takes a while to get used to, but this is really how we're meant to be eating (eating real food!) and you'll find it gives you a much better start to the day. Just to clarify what you’re aiming for in choosing healthy carbohydrate sources to manage your diabetes. 1. 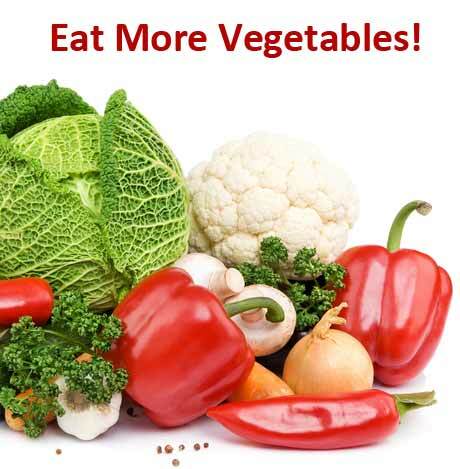 Vegetables are your number one main priority and inclusion – mainly non-starchy vegetables. There is such a wide variety to choose from that you will never get bored. The aim is a minimum of 5 serves a day – equal to about 2.5 cups, but you should easily be able to eat more. 2. Berries can be eaten in moderation. Around1/4 to 1/2 cup per serve. 3. Small amounts of beans and legumes such as lentils, northern beans, or pinto beans. Around 1/4 cup per serve. 4. Avoid all grains if you can. 5. As a rule do not displace vegetables for any other type of food, you must get those veggies for their super nutritional power! Stick to those simple rules and you will find yourself having less struggles with lowering and maintaining blood sugar! Please share this great resource around with other friends who may need it. This is great advice. I know because in about a year I brough A1c from 9.6 to 6.8 using very similar deit foods to those recommended here. If only this info had been available before. When I first realized I was in danger of diabetes I went low glycemic with sugar busters book. Through blood sugar testing I found rice and pasta, even low glycemic was not good, so eliminated them too. I stayed healthy, non-diabetic for two tears, until I saw a nurse deitian who told me I worried too much, convinced me to go on a regular diabetic deit. Next time I got tested I had passed the threshhold into diabetes, taking metformin ever since. A little over a year ago my A1c reached 9.6. Last visit I had brought it down to 6.8. The doctor wanted to put me on additional drugs that I was uncomfortable with the dangers they repressented to kidneys. After I refused she agreed to give me support (perscribing better blood test options so I could better moniter) and a nutritionist to support my effort. I ignored the diabetes association deits that allow bread, potatoes, etc. and went back to low glycemic. My results improved, but testing blood led me to some of the same conclusion your deit recommends, no grains or bread except tiny amounts whole grain crackers, smaller portions of beans, no sweet potato (that and giving up banans was difficult) and being very mindful of fruit, only eatting small amounts with cheese, or sticking to berries. Why is it that doctors and the american diabetes association push horrible deit plans that allow bread, potatoes, etc.? It is truley awful they do this when proper deit can bring diabetes under control in so relitively short a time. In a little over a year to go from 9.6 to 6.8 (and continuing to improve) just by following a plan similar to the one you describe! Yes, it is pretty appalling that the associations push a diet that actually makes people worse, not better. That’s why we work so hard to spread the word. Glad to hear you’ve found a pathway to better health Elliot! I want to know why sometime it recommended to have a lot fruits, sweet patotoe? and this article fruits and patotoe will not a good choice for you? Some other professionals and organizations allow fruit and sweet potatoes because they are “natural” and contain vitamins and minerals. These are not foods we encourage simply because they are just too high in carbohydrates- especially the sweet potatoes. If you eat these foods and then check your sugar level 2 hours after it’s very likely your sugar will be elevated higher than what is desired. If your sugar is well controlled you may be able to include some of these fruits into your diet occasionally. Make sure to test after fruit if you do decide to include! Thanks a lot for this comprehensive guide! Would love to add one thing: there’s a big difference between whole grains and baked products (even if they are made with whole-grain flour). A serving of cooked brown rice/oats/barley is a much better option than whole-grain bread or pasta. It takes more time to digest and results in a milder glycemic response. It sounds like you a referring to the glycemic index, Alex. Whole grains with higher fiber content often lead to a milder glycemic response, however this it’s often a very individualized response. Not to mention, serving size is still key with all grain products. For example, the serving size of brown rice is 1/2 cup = 19 g of carbs. Considering most people eat 2-3x that serving, the glycemic response is not going to be so mild anymore, meaning blood sugar will rise much to high after your meal. 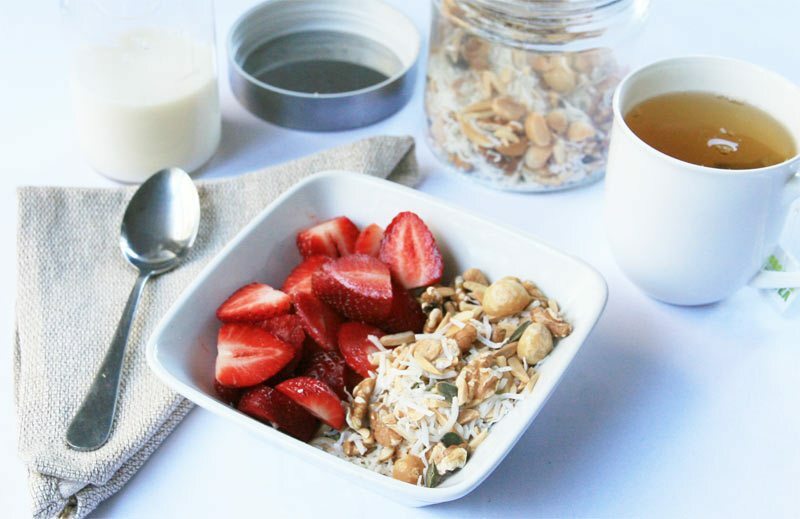 If you choose to include brown rice/ oats/ barley in your diet make sure to stay diligent with your portions and monitor your blood sugar after meals to check for tolerance. Leads us to another parameter that’s even more important than the glycemic index, and that’s the glycemic load. That’s why, for example, a serving of cooked veggies is a much better option than a serving of white flour pasta, although they both have a high GI. Alex, definitely check out the article I hyperlinked in my initial response! There are some drawbacks to the glycemic index and people are better off just counting carbs and monitoring their intake of carb containing foods- hence low carb vegetables are absolutely a better choice than pasta as you said! can you suggest the Diet plan Please.What should i eat? Consider joining our member club where meal plans will be emailed to you weekly! To give you an idea of what our meal planning service looks like, check out this sample two day meal plan. Remember, through a combination of diet, exercise, and possibly medication your goal is to maintain a near normal A1c level, ideally under 6%. My husband is T2 diabetic. I have some questions, and the information is a bit confusing. How do you get more sodium (15g) from 1-2 freshly juiced apples, but there isn’t any sodium in 1 regular apple without juicing it? 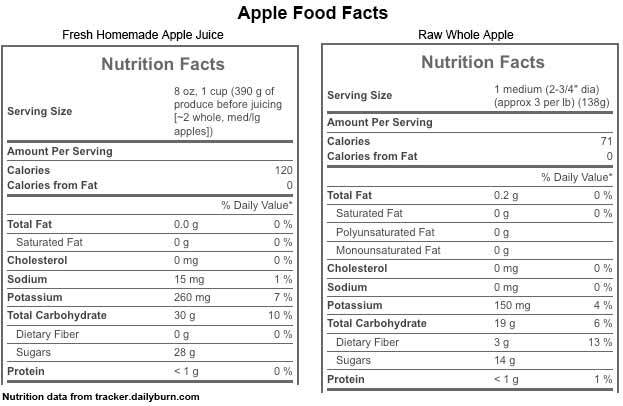 Apple juice has 0 g of fat, but 1 raw, unjuiced apple has 0.2 g of fat? I am totally confused on the labels and information presented by everybody from this website, the government, the nutritionists, the physicians, and the American Diabetic Association. Eat this, but not that, but then someone else says Do not eat this, eat that. You’re right that nutrition and health information can get confusing- that’s why our aim at DMP is to translate the latest science and research into easy to understand, applicable information. We encourage a low carbohydrate diet for those people with type 2 diabetes/ prediabetes because that’s what science shows works! To make it really easy to follow, we’ve even created a food pyramid to visually demonstrate the most blood sugar friendly foods. The values for fat and sodium that you are listing are both pretty negligible. Apples do contain a small amount of sodium- about 2 grams per apple- most fruits and vegetables will contain a tiny bit of sodium actually. The more important factor is that due to its high carb/high sugar content, juice is never a good choice for type 2 diabetes. Whole apples aren’t encouraged either- better choices would be strawberries, blackberries, or raspberries. Let us know if there is anything else we can help clarify for you and your husband. Jedha what about barley? I read multiple papers stating it is a good from for diabetes. Great question! Barley is a whole grain and is considered a complex carbohydrate. As explained above, complex carbs are healthier options compared to simple carbs but they still contain large amounts of carbs that impact blood sugar levels negatively, especially whole grains. We encourage people to exclude all grains because it generally brings much better results with blood sugar and A1c. I was wondering could you give me some advice on what numbers to be looking at on packaging. Trying to get my head around it all and after following a slimming world diet for years I have to completely change my thinking. E.g. how many carbs per tub of yougart should I be looking to keep it under? There is no definitive answer to this for each food Fiona, as your carb intake is levelled out over a total meal or for the entire day. Overall, you want to look for products lower in carbs but also with quality ingredients. If it’s a tub of yogurt full of aspartame, an artificial sweetener known to contribute to weight gain, then it’s not a great choice. In general, plain yogurt is going to be the best. We do have a food labels series coming soon, so keep your eyes open for that. Are greenbeans a good or bad vegetable? Thank you so much for putting this together. It makes sense to me and I love a challange. Its sites like this that truely make a difference when you are looking for answers. I will be subscribing. Thanks for your kind words Maryna! Glad you enjoy our info. Question: If I’m targetting 50-80grams of carbs what should be my Protien and Fats? I reread, and had made a mistake about all this new evidence you have been writing about! On re-reading I discovered that the findings are not by the FDA, but from independent laboratory studies. Yes Cheryl, all the information we provide here is evidence-based. We research what the latest science has to say about everything so we can keep you informed. I had high blood sugar reading, but it is not a genuine organic pre-diabetes. It has been artificially caused by unwanted medications, the same case for a first degree heart block. What about having to keep cholesterol and saturated fat down as well as carbs. One egg yolk has enough cholesterol for the whole day! Eating eggs does not lead to high cholesterol Cheryl – this is a BIG nutrition myth. They even removed the cholesterol concern from the most recent dietary guidelines, as there is absolutely no evidence for this commonly perpetuated myth. Your body produces cholesterol internally with the liver largely responsible for it’s production. Sugar and carbohydrate foods lead to more cholesterol production than eggs. Egg yolks are a highly nutritious food source and studies show they are perfectly safe to eat, including for diabetics and do not lead to high cholesterol. As for saturated fats, there are some myths there, too. Overall, we encourage a higher intake of monounsaturated fats – olive oil, olives, avocado, macadamia nuts, macadamia oil; along with polyunsaturates (especially omega 3s) – salmon, chia seeds, walnuts, tuna, sardines, nuts and seeds. We have more information coming on fats, cholesterol and eggs soon, as it’s a common misconception area. Thanks for answering me on this subject! The article about the FDA new evidence about cholesterol is interesting. The pros and cons are on the ping pong table. All things considered, (and I will consider because I love eggs etc. ), you must still agree with others that anything in excess, even good oil, can be bad for a person. Actually Cheryl, not really. There is rising evidence for ketogenic diets being beneficial for many health conditions, and these are made up of 70-90% fat. Fat is not bad. But certainly there are types of fats better for us and it also depends on the overall composition of your diet and how fat sits within that. As for eggs, these are to be enjoyed, yolks as well. Scientific evidence, even in diabetic subjects shows no impact on cholesterol. We’ll have more info on this soon. I think you might find Sheryl’s story an interesting and surprising read. What about oranges and grapefruit are they ok ? Check out this info on fruits Ivy. Is there a recipe for the microwave 2 minute bread? Hi Phyllis, at the moment we only have that recipe available to members. You can google or Pinterest many no carb bread recipes. 1. Is quinoa a good replacement for rice/pasta? And are the red, black and white quinoa all equal in proteins and carbs? 2. Eggs, I love boiled and poached eggs. I love my veggie and egg omelets. how many eggs can I have per week, per day. I use one egg and some egg whites to make my dishes. 3. can we use almond flour, or coconut flour for bake? Thanks for your wonderful compliments about the site, that is the aim, simple and easy to understand info, which we will continue to build upon. Yes almond flour and coconut flour are great choices. Coconut flour moreso than almond because too much omega 6 is not good (almond flour). I have 2 questions: But first, I am not diabetic, I was diagnosed as pre diabetic last year. After losing 20 lbs. and exercising (pool aerobics almost every day) I am, I think what is called “pre diabetic remission”. My numbers have dropped considerably. I follow, almost all of your recommendations except for the fruit part. As I do eat more of a variety of fruit but in moderation. Question 1: I usually make my sandwiches with lettuce for the “bead”. Once in a while I use a Lavash Bread or half a low carb pita which is paper thin and has 9 carbs for the entire piece. I only use half. Will this affect my numbers? Question 2: I don’t use artificial sweeteners and am a label reader at the grocery store. How do you feel about using whole fat food products, in moderation, as opposed to fat free or low fat. I understand these products have other ingredients to replace the fat content and are not good for you. I love cheese and have read a combination of apple cider vinegar in water and a slice of cheese before bed will lower glucose levels in the morning. As well as cinnamon and apple cider vinegar in a glass of water in combination at mealtime. Whats your opinion? Thanks and look forward to reading Type 2 Diabetes Talk always. Q1: 9 g is not a lot but ‘flour’ based products do tend to raise blood glucose more than other things. Have you tested you BS after eating it compared to other things? This is your best measure because this may be fine for you. I have type 2 diabetics as well as a high potassium issue. So much so that I have to drink soyalstat every day to flush the potassium out of my blood. I have been to 4 nutritionists and cannot get help as the two conditions are contra-indicated. Can you help me? That is a tough one Diana, and does make eating difficult. Unfortunately we can’t give diet specific advice as we don’t know your full history and this does sound like a case where medical intervention is necessary to solve.